Okay, so we all know I’m a geek, but I don’t just watch science fiction and fantasy when it comes to movies and TV. Mostly, but not exclusively. Not long ago, we decided to give up cable. It’s expensive and, really, no one was watching it. My oldest daughter watched the occasional show on the Food Network and my wife used the TV to fall asleep at night. Everyone else got their entertainment online or from DVD/Bluray disks. It’s been two months, and no one misses it. Now we’re pulling out all of those DVDs and Blurays we buy on sale and forget about. This is a good thing. Last year during Boxing Week, I picked up the first season of Remington Steele for $10 and put it on the “To Be Watched” shelf next to the complete series of The Greatest American Hero and the fifth season of Babylon 5. We pulled it down a week or so ago, a switch from the mixture of Farscape and Community that we’ve slipped into lately, and leaned back for some mindless entertainment. Except it’s not that mindless. It’s clever, fun, and a neat mixture of comedy and 1980s noir. Well written and well acted. We’ve watched the first six episodes so far and I’ve enjoyed every one of them. The chemistry between Pierce Brosnan and Stephanie Zimbalist makes the show work from the beginning and they’re great together. It’s also a pretty neat window into early 1980s TV and technology. This isn’t a review, or even necessarily a recommendation. Or maybe it is a recommendation, but I’m not saying you should rush out and buy it. We’ve entered an age where you can download a TV show while it’s still on the air or buy it as a feature-packed set before the season is over. The rush to produce content so we can empty our wallets before we get bored seems to drive the various entertainment industries into an ever-faster frenzy. I think it also tends to drive quality down. Sometimes, it’s worthwhile to go back to a time when the show itself was the thing, to find a show worth watching for itself. 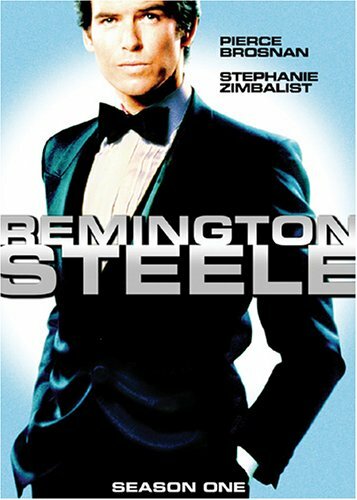 Remington Steele is definitely one of those shows, but your mileage may vary. Take a break from the latest collection of rush jobs to hit the coaxial cable and find one that works for you.